Building strength and mastering control of your body, is basis for building proficient lifting techniques.Once you are able to perform a task with greater ability, you can then do so at a faster pace. This defines power. Power can be referred to as strength speed. Certain lifts, movements, and drills when performed at a faster rate, produce power output, but none of this can be done without first having built a foundation of ability to perform even the most basic tasks. In explanation, a novice needs to master the ability to properly perform movements such as Deadlifts, Squats, and Overhead Press, before trying to grab a bar to perform Clean and Jerks. 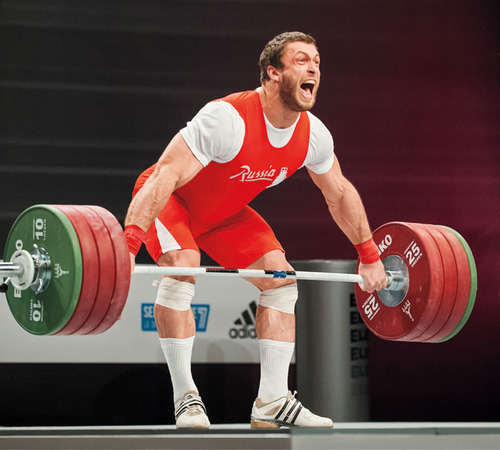 Everyone’s Deadlift is much higher than his or her power clean. What you really need is explosive strength. This shows most obviously when your leg extension goes beyond ninety degrees. The faster you go from ninety to 180 degrees, the more you are going to power clean. Those fibers will have to keep firing all through that portion of the lift…Power. ‘Making the plates rattle’ A sure fire way to know that your power is explosive all the way through, to the top of the lift along with significant speed. This is a training tool I use to ensure powerful force in driving upward. Conclusively- Key mechanism of speed, power and strength, working in complete correlation are necessary components for successful Olympic Lifts.